Before Beijing, the No.1 Olympic sport was at death’s door, some argued, due to the deluge of drugs revelations. With the IAAF World Championships about to start, doom mongers gathered to perform the last rites. Track and field, they said, could not be taken seriously anymore. Yet ultimately there was no China crisis during a memorable nine days in the Bird’s Nest stadium. Athletics is back from the supposed dead and lives to fight another day. How? By letting the athletes do their talking on the track. 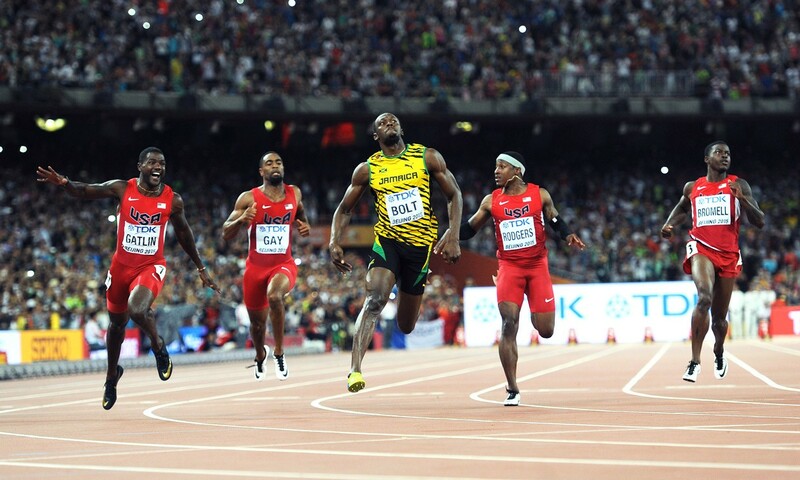 It began with Usain Bolt winning the men’s 100m on the first weekend of the championships. Hype that billed the race as a ‘battle between good and evil’ was over the top, but the head-to-head with Justin Gatlin was definitely symbolic and the Jamaican scored a victory for everything that is good about the sport. Bolt’s 200m win was more emphatic and it took a rogue cameraman on a Segway to earn the dubious accolade of being the only man to bring Bolt down all week. The sprint legend was not alone in helping resurrect athletics’ ailing fortunes either. Ashton Eaton’s demolition of the decathlon world record makes a mockery of CrossFit’s claim that it produces “the world’s fittest athletes”. Throughout an epic two days of sprints, hurdles, jumps and throws, the American amazed onlookers and has hopefully made inroads into becoming the household name that his talent deserves. Likewise, Jessica Ennis-Hill’s heptathlon win was a masterclass in track and field. The Briton had bounced back from the birth of her first child only a year earlier, too, which made her performance all the more remarkable. Ennis-Hill’s team-mate, Mo Farah, sealed a unique ‘triple double’ of global golds over 5000m and 10,000m. More than most, the 32-year-old had endured the brunt of negative headlines in the run-up to Beijing due to his links with controversial coach Alberto Salazar. But he fought off fierce challenges from Caleb Ndiku in the 5000m and Geoffrey Kamworor in the 10,000m and he did it so coolly that he even had time to veer toward the outside lanes mid-race to take a drink. Triple jumper Christian Taylor is another amazing athlete and superb role model who lit up the championships with an 18.21m leap that almost broke Jonathan Edwards’ world record. Dafne Schippers was in similar form in the 200m as she sped to a 21.63 championship record and perhaps a new era of Dutch dominance over the distance. David Rudisha and Asbel Kiprop were magisterial and popular winners over 800m and 1500m as their long legs helped to hoist Kenya to the top of the medals table. Even more stunning were the performances of Genzebe Dibaba over 1500m and fellow Ethiopian Almaz Ayana over 5000m as they blitzed their rivals. Inevitably, there were surprises as well and Canada was particularly adept in the giant-slaying department. First, Shawn Barber beat French favourite Renaud Lavillenie in the pole vault. Then Derek Drouin came out tops in a high jump contest that saw Ukraine’s defending champion Bohdan Bondarenko and Qatar’s world No.1 Mutaz Essa Barshim among the also-rans. New stars aplenty were born. Wayde van Niekerk of South Africa blasted to a super-fast 43.48 in the 400m, Julius Yego of Kenya was equally impressive with a mammoth 92.72m javelin throw, while Ghirmay Ghebreslassie of Eritrea beat a star-studded marathon field at the age of 19. Elsewhere, results went with the formbook. Caterine Ibarguen of Colombia continued her amazing triple jump win-streak. British long jumper Greg Rutherford sealed a ‘grand slam’ of golds when he added the world title to his Olympic, European and Commonwealth crowns. Allyson Felix was supreme in the 400m as she coasted to a 49.26 world lead. “This was athletics as a sport, fighting back, showing it’s alive, vibrant and the stories that are within in,” said world marathon record-holder Paula Radcliffe when summing up the championships on BBC. Of course, doping problems have not vanished overnight and need to be tackled with greater venom (and money). There is cause for considerable optimism, though, if you consider that the nation most under fire for breaking anti-doping rules – Russia – fell from top of the medals table in 2013 to a mere ninth in 2015. Sports fans with a brain will also recognise that doping is not, as the media would have us believe, restricted to athletics and cycling. Cheating happens in all walks of life and anybody who believes footballers or tennis players, for example, are not tempted to take drugs in order to gain speed, strength or endurance is extraordinarily naïve, especially when the financial rewards in those sports are often greater than those in athletics. Sebastian Coe will now enjoy a honeymoon period in his new role as president of the IAAF, but what a flying start he’s enjoyed in Beijing. Athletics has the ability to surprise and enthral like few other sports and, for a few days at least, the drugs stories have been partly forgotten. Could this mark a clean start for athletics?